A two day course to introduce the fundamentals of waterfall ice climbing and related ropework. Moving on ice from French technique to "full - on" front pointing will be introduced. Basics of ice anchors and belays are part of the program. Technical gear including crampons, ice tools, harness & helmet are provided. A basic rock climbing course or some previous rock climbing background is a definite asset. Add a third day for a guided waterfall ascent. An introductory letter containing further details for prospective course applicants can be viewed online. For those people who have already taken basic waterfall ice (prerequisite) and have gone on a few climbs , this is the next step. Learn more about ice anchors, including the techniques used to begin leading and more. Improve your ice skills and learn about multi-pitch climbing. Pick up valuable knowledge on safety and other important considerations. Add a third day for more multi-pitch ice climbing. An introductory letter containing further details for prospective course applicants can be viewed online. This five day course includes Introductory Waterfall Ice, Intermediate Waterfall Ice plus an additional day of guided ice climbing. An introductory letter containing further details for prospective course applicants can be viewed online. Leading on ice is the name of this weekend. Small groups and good student : instructor ratios get you safely on your way to more serious climbing. Offered on demand. A two day course for younger climbers who want to discover waterfall ice climbing and related ropework. Similar to Introductory Waterfall Ice. Similar to Intermediate Waterfall Ice. This two day course will introduce participants to the avalanche phenomenon. The winter snowpack, avalanche terrain, safety measures and rescue procedures will be covered in a mix of classroom and field sessions. An absolute must if you are going to head out ski touring in the mountains. An introductory letter containing further details for prospective course applicants can be viewed online. Speaking of ski touring... Are you familiar with the new American (US) and Canadian Avalanche Danger Scales. You can view them or download pdf versions. And don't forget to check out the avalanche bulletins before you go. This two day course will go beyond the introduction and spend two more days primarily in the field practicing terrain and snowpack analysis and learning other stability tests. This course will pick up where the other awareness courses leave off. (Taught over two weekends or alternatively five consecutive days.) More routefinding, terrain and snowpack analysis, a visit to the ski area and plenty of hands on will highlight this course. Essential for trip leaders and those heading out ski touring on their own who will have to make their own decisions.An introductory letter containing further details for prospective course applicants can be viewed online. This course provides total immersion in the avalanche phenomenon. (Taught over seven consecutive days.) 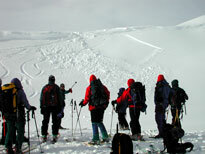 It is a combination of Introductory and Advanced Avalanche courses back to back! An introductory letter containing further details for prospective course applicants can be viewed online. Special Note on Ski Touring Courses: Participants must be in good physical condition and able to ski uphill and downhill in control with a full day pack in variable off trail snow conditions. A two day course to introduce persons already familiar with cross country skiing or ski touring to the techniques necessary for safe travel on glaciated terrain. The course deals with glacier hazards, crevasse rescue, winter snow & ice anchors, roped glacier travel, track setting and routefinding on glaciers in winter. An introductory letter containing further details for prospective course applicants can be viewed online. A new two day course that focuses on skiing in non - glaciated alpine terrain on either telemark or randonee (alpine touring) equipment. An introductory letter containing further details for prospective course applicants can be viewed online. This relatively new offering is a combination of Introductory Avalanche, Introductory Ski Touring and Ski Techniques and Introductory Ski Touring and Winter Glacier Travel. Seven consecutive days of solid grounding in the fundamentals of safe travel on Ski or snowboard in the winter. An introductory letter containing further details for prospective course applicants can be viewed online. A five day introduction to overnight mountain ski touring on non-glaciated terrain. Trip & menu planning, routefinding, track setting, winter camping, group management, hazard evaluation and much, much more. A super way to get started, capped off with a multi-day ski tour. Only offered on demand. Prerequisite: Introductory Avalanche. A five day introduction to overnight glacier ski touring. Roped skiing, glacier travel, advanced crevasse rescue, winter camping, short roping, trip planning, hazard evaluation, route finding & navigation, a multi-day ski tour and (if weather permits) a summit ascent are packed into this course. Don't miss it.Only offered on demand. Prerequisite: Introductory Avalanche. Camping tips and construction techniques for Tents, Igloos, Snow Caves, Quinzees and A-frame trenches are on the menu for this course. The group will build these shelters, then you pick one to sleep in. An introductory letter containing further details for prospective course applicants can be viewed online. Essential for everyone in the mountains. See the Emergency Care section for details. Other Courses: We offer a number of other courses including combinations of those listed. Custom courses in Climbing, Rescue & PreHospital Care, as well as private guiding services are available. We can offer anything from weekend trips to classic tours like the Wapta traverse or Columbia Icefields.